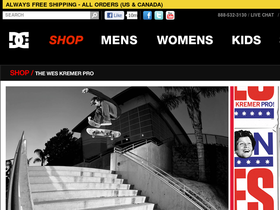 DC Shoes offers free shipping to the U.S. and Canada. See site for more information. Click here to check out the sale section at DC Shoes and save up to 50%. Shop today and save. Enjoy extra 40% savings on sale items at DC Shoes with this coupon code. Click here to shop. Shop at DC Shoes and enjoy free shipping on all orders within the U.S. and Canada. Click here to get started. Shop at DC Shoes and save up to 50% on men's sale items. Click link to shop. Save up to 30% or more on women's footwear on sale at CShoes.com. Click this link to start shopping. Save up to 20% or more on items in the Rob Dyrdek collection at DC Shoes. Click here to view. Shop at DC Shoes and find DC hats for as low as $20. Click link to shop.